Everything in your life worth something requires a bit of upkeep and maintenance to sustain its value and prevent failures from occurring. It really doesn’t matter whether we are talking about relationships, the car you drive, your teeth, or even the garden in your backyard. So it should come as no surprise to realize that your molds need that same kind of attention to detail. When it comes to molding parts, the belief is that you are only making money when your machines are running and actively producing parts. This fact leads to many companies running below their optimal productivity level. The idea that a slower release (production) time, or a few blank shots is alright is counterproductive to the end goal and can easily be remedied. To make sure we are all on the same page and for demonstration purposes, we are going to compare your molds to your teeth. For most people their teeth are extremely precious assets and the thought of replacing them is not an option, they are pretty critical for daily use, and necessary to eat, which means when there is a problem it can cause major issues. Most people know that they need to take care of their teeth if the want to have optimal health and happiness in the long term. They are careful about what they are eating trying not to damage their teeth. They brush and clean them at least once but preferably twice a day. Occasionally they floss to get the extra little tiny bits out and for the most part this is what they do on a day to day basis and it works, most of the time. To be sure that you keep your teeth as long as possible, it is recommended by the American Dental Association to schedule a cleaning and a check up every 6 months. But why you may ask, I mean obviously you take care of your teeth on your own. Why is it necessary to take time out of your day, to be inconvenienced, and pay money when there is no real problem. I mean sure really cold things hurt your teeth occasionally, and sometimes it hurts to chew on one side. You have 32 teeth, so who cares if one or two are not working correctly all the time, its still getting the job done. “Those things are to be expected, everyone has that.”you might say. But what happens when it starts as an hidden cavity, then it goes to a root canal, and if untreated eventually you loose your tooth. Now you have a problem that most likely could have been avoided with a small inconvenience, minimal discomfort, and a small fee. Instead you are looking at possible emergency situation meaning multiple days, likely surgery, and a very large bill. The same can be said with you molds. So far we have talked a lot about teeth, but this is not an article about dentistry, so how does this apply to molds and the idea of mold maintenance. Just like your teeth can have corrosion and hidden problems that may be hard to spot, the same can be said for your molds. Molds are complex pieces of equipment, with inner workings that must be thoroughly maintained in order to meet their full potential. This means that all the cavities and cores need to be in good order, the parting lines need to be sharp and unbroken, waterlines need to be clean and clear, mold maintenance needs to be precise, and the mold should be well lubricated and ready to work, otherwise its like tooth with a minor cavity that can turn into a root canal. A preventative mold maintenance schedule is the equivalent of your annual dental cleanings. It is the understanding that methodically planned minimal downtime to inspect, clean and correct is better than reduced production, inefficiency and potential failure. It has been proven that regularly scheduled maintenance programs, even with down time will boost your bottom line by improving efficiency, limiting waste parts, extending the tool life, and shortening cycle times. Many molding plants today are settling with running at 80% part efficiency with shots taking longer than they should because of easily fixed solutions, but the thought of being off-line is unacceptable. A record book is created specifically for that mold. It will be used to document every single thing that happens from this time forward including; the date it came in, the processes that are done, if and any issues that may be found, how they were fixed, necessary replacement parts, and when it was finished. This allows the company to track the life cycle of mold, the individual cavities and to follow if it continually has the same issues and find a solution. The mold is taken apart deep cleaned and inspected for any problem areas. If there are any broken or damaged components they can be repaired and or replaced per the customers approval to ensure optimal success. A complete breakdown and charting of mold components including; leader pins, bushings, side locks, etc. is recorded for periodic replacement. Flushing and cleaning of water lines for improved cooling flow. Grease, rewiring, and assembling for next part run. Complete documentation and reporting complete with a recommended return. Now looking at that list you may say, “That is a lot of stuff to get done, there is no way my operation can be down that long.” You might be surprised to know that the average preventative maintenance service depending on the molding size, number of cavities and complexities can be completed in as little as 72 hours. Worst case scenario, larger more complex molds with high cavitation can take up to two weeks. The relatively quick turnaround is because a scheduled process typically means that you are working on molds with only minor issues and requiring minimal upkeep instead of full blown rebuild. 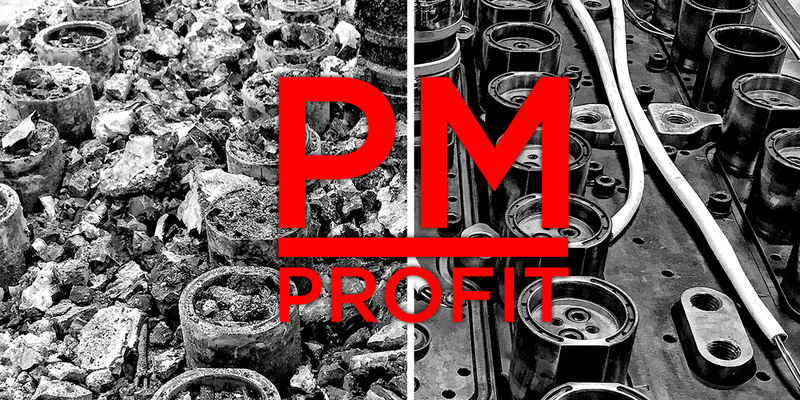 We stated earlier that preventative mold maintenance can increase your part production and ultimately improve your bottom line which is what we are looking for, but how? In a recent real world example our customer was running a 32 cavity unscrewing closure mold. It was at the end of its prescribed 4 month molding cycle only running 24 functioning cavities with a cycle time of 21 seconds. After a preventative maintenance service, all 32 cavities were running with a cycle time of 11.5 seconds. Now lets look deeper into the numbers. 2688 run time hours x 4114 parts per hour = 11,058,432 parts per 16 week production cycle. $.05 per piece x 11,058,432 parts per production cycle = $552,921.6 per 16 week production schedule cycle. 2688 run time hours x 10,016 parts per hour = 26,923,008 parts per 16 week production cycle. $.05 per piece x 26,923,008 parts per production cycle = $1,346,150.4 per 16 week production schedule cycle. In this instance complete mold downtime including pick up and delivery, inspection, correction, repair, and reassembly was 8 days or 192 hours. How does this affect the end numbers? 2688 run time hours – 192 PM hours = 2496 available run time hours. 2496 run time hours x 10,016 parts per hour = 24,999,936 parts per 16 week production cycle. $.05 per piece x 24,999,936 parts per production cycle = $1,249,996.8 per 16 week production schedule cycle. $697,075.5 – $13,440 PM costs = $683,635.50 total profit over 16 weeks. Once you break it all the way down in this way it becomes very easy to see that any time your are running your mold at less then capacity you are losing money fast. By taking a proactive approach and purposefully limiting your downtime you are increasing productivity and putting more dollars in your pocket. Even better you are able to maintain control of your timeline, manage expectations and extend your tooling life. In the end isn’t this what we are all looking for?